The BW-HA advanced wireless handheld brings an additional level of portability to the BroadWeigh system by expanding its standalone monitoring capabilities. Supports overload and underload warnings for individual shackles, groups of shackles and windspeed sensors. Backlit display makes the device usable in low-light environments. 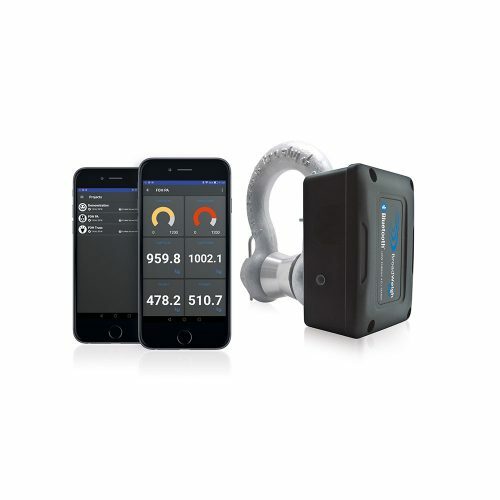 Ideal for walking between different stages with the handheld and picking up readings from all shackles independently of other monitoring systems. With simple wireless configuration and calibration the licence free 2.4GHz Broadweigh Advanced Wireless Handheld Display (BW-HA) uses direct sequence spread spectrum (DSSS) radio telemetry technology. This provides high integrity, error free communications and is FCC, ETSI and IC approved. The devices features a backlit display, which makes it usable in low-light environments. Broadweigh wireless handheld display BW-HA is powered by a pair of standard alkaline AA batteries and is configured using free BW-Toolkit software which runs on a PC connected to the BroadWeigh base station. Introducing the BroadWeigh Blue 3.25 tonne load shackle which takes advantage of Bluetooth Low Energy 4.0 technology to provide close range monitoring. Direct to our BroadWeigh Blue App. A lower cost option for smaller, static applications, this load cell requires no other accessories. Download our free App to your smart device and in minutes you will have created and configured multiple project dashboards showing display tiles of BroadWeigh Blue shackles. View individual load points, create summations of loads within a group, set visual indicators and time based line charts. Download App on multiple devices for viewing in different locations to give your team wider visibility. The software does not take advantage of 64 bit operating systems nor direct advantage of multi core processors, but is compatible with both. Each sensor mapping value on the 100 channel data logging software is shown in a re-sizable window. User-defined mathematical functions can be applied to each data channel & display e.g. the reading from one shackle or the summed readings from many shackles. Conditions such as communication loss, battery low, data range over / under can be indicated by audible & visual alarm. Logging of data can be initiated at an overload point or when approaching or leaving overload. BW-LOG100 load monitoring software also allows logging on demand or at set intervals. BW-LOG100 now has a graphics feature that incorporates drawings and pictures into the data logging display. Remote access to data using tablets and smartphones via a Webserver is another feature of BW-LOG100. After the first stage of sensor mapping display channel design, graphical backgrounds can be constructed from pictures etc which can show the data in many different ways including digital format or bar display. BW-LOG100 can accept up to eight separate views (or pages) of a structure which can quickly be navigated between. JPG, GIF, PDF and DXF are just some of image formats that can be imported. Designed and produced in the U.K. This highly durable case is tested to military standards and is up to 6 times stronger than traditional moulded flight cases due to its stainless steel ‘I’ brace corners and impact resistant panel material. It offers full protection from whatever you can throw at it – it is water and dust resistant, rated to IP55, hard-wearing, shock and impact resistant. Available with a selection of interchangeable, high density impact foam inserts for precision engineered protection for the BroadWeigh product range. The case is also is aesthetically pleasing thanks to rubber shock absorbing corners, ABS plastic coated aluminium frame and stainless steel fittings. Designed and produced in the UK, the BroadWeigh BW-CASE-A has a host of features such as unit stackability, substantial locking latches, durable wheels, heavy duty carry handles and lockable extending handle. The unique construction also allows for quick and easy refurbishment. BroadWeigh ThumbScrews (BW-THUM-SET) are designed for quick and easy access of the the battery housing on BroadWeigh electronic enclosures by hand and without the need for a screwdriver. This provides an easier solution for tightening or loosening enclosures when working with installations at height. Available as an accessory in packs of 4. The BroadWeigh active repeater is designed to help propagate the wireless signal, and can be used to enhance the signal in different environments, bounce signals around obstacles or double range – in line of sight applications. The active repeater (BW-AR) is powered by either a pair of alkaline ‘D’ Cells or an external power supply (5-18 Volts). and acts as transparent link between the BroadWeigh shackles and either the USB base station or handheld display (BW-HR). The BW-AR adds flags to any messages to present multiple repeated information and can effectively double the transmission range. Adding multiple wireless active repeaters will not increase the range but can increase overall coverage. The BroadWeigh shackles have a range of up to 800 m (2600 ft) which can be potentially doubled using BW-AR. The BW-HR wireless handheld telemetry device provides an 8 digit LCD reading from an unlimited number of BroadWeigh shackles (either BW-S325 or BW-S475 versions) and also can display readings from the BW-WSS wind speed anemometer. The scroll button on the handheld telemetry device is used to view any shackles or anemometers in range. The shackle / anemometer with the strongest signal strength, and therefore nearest the BW-HR handheld, will be the first to be displayed. The ID tag of the shackle / anemometer is shown on the screen before it displays the reading. Other shackles / anemometers are displayed in order of signal strength with any new shackles / anemometers introduced later added on the end. These ID tags can be renamed to suit individual requirements as long as the tag follows a four digit hexadecimal format. With simple wireless configuration and calibration the licence free 2.4GHz Broadweigh Wireless Handheld Display (BW-HR) uses direct sequence spread spectrum (DSSS) radio telemetry technology. This provides high integrity, error free communications and is FCC, ETSI and IC approved. Broadweigh wireless handheld display BW-HR is powered by a pair of standard alkaline AA batteries and is configured using free BW-Toolkit software which runs on a PC connected to the BroadWeigh base station. The technical staff of a well-known theatre in the UK wanted to monitor the loads imposed on the house grid by visiting productions. With a diverse range of incoming shows and fast turn-around times between shows, fast and simple deployment is paramount to effectively gather load data without interfering with the production’s setup process. Using a kit of 4 x Wireless BroadWeigh shackles (BW-S325) and a BW-HR Wireless Handheld Display / reader the production manager is able to quickly assess distribution of load imposed be a productions setup as it is being suspended. After installing the shackles into the grid and then simply turning on the BW-HR wireless handheld the BroadWeigh shackles are instantly brought to life providing live readings of the rigging and the load it supports. Once the rigging is complete and the loads approved by the venue technical staff, the shackles can remain in situ for the duration of the production providing the ability for periodic checks as required via the wireless telemetry system. Mantracourt’s expertise in wireless telemetry has been combined with the high quality and industry-renowned Crosby shackle. The BroadWeigh™ Crosby Load Cell Shackle features a high accuracy, precision engineered, load-pin and integrated electronics. This allows load monitoring without the need for time consuming and costly cabling. Built to withstand the demands of varying environments and weather, the BroadWeigh Load Cell shackle is also equipped with a load centralising bobbin as standard. 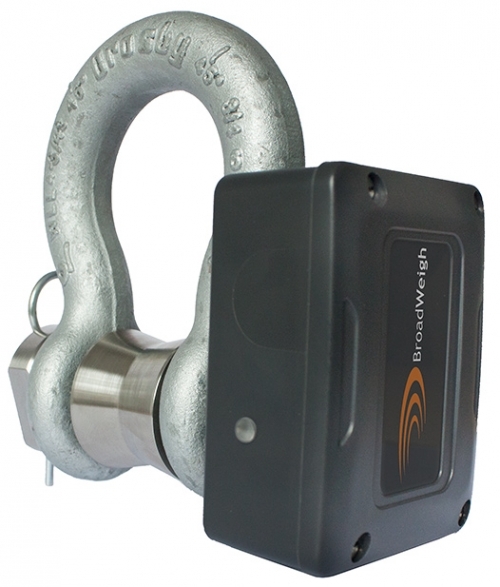 Designed to aid rigging professionals on a daily basis, the BroadWeigh wireless Crosby load cell shackles offer simple, real-time, effective and accurate load monitoring. It allows users to know the precise loads on any given rigging point, guy wire or hoist in a rigging system. This valuable data enables the rigger to safely distribute weight for indeterminate loads, roof structures, mother-grids as well as indicate alarms to avoid rigging component overload situations. The BW-BSue wireless USB base station has the advantage of extended range meaning a line of sight range of up to 800 m for all BroadWeigh (BW) shackles. Casino Rama, a major concert and event centre in Ontario, Canada, has a concert hall with a capacity of 5,000, safety of its guests, performers and staff is a top priority. They needed a load monitoring solution to ensure the correct balance of their rigging. 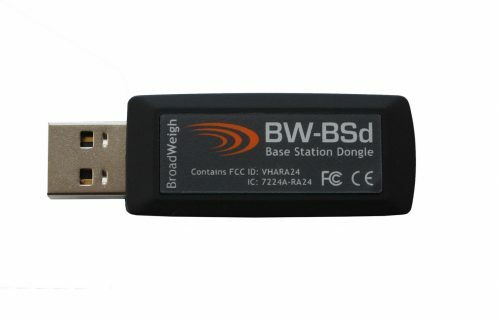 The BW-BSd wireless USB dongle enables you to connect to BroadWeigh (BW) shackles at a line of sight range of up to 500 m. It provides a portable solution with no wiring that makes it ideally suited for laptops and tablets that run a full version of Windows. It is offered as a portable alternative to the BW-BSue base station which provides up to 800 m range. The pre-calibrated BroadWeigh Wind Speed Sensor (BW-WSS) anemometer provides both real-time display and full logging of wind speeds. With user definable sampling rates and easy wireless installation this anemometer makes an ideal choice for general wind speed monitoring and action planning for outdoor events. On-location monitoring is a critical aspect of weather management in conjunction with regional weather reporting and prediction services. The BroadWeigh system offers supplier data processing and recording which enables the user to develop reports, trending and trigger peak speed alarms. The wind speed sensor constantly monitors average wind speeds over the range of 5 to 125 mph and can be configured to provide readings in a number of standard units including mph, fps, km/h and m/sec. It also measures gusts at user defined periods of 1, 3, 5 or 10 sec. The BW-WSS uses a low power mode between transmissions to maximise battery life (in excess of 12 months) in the field whilst offering class leading wireless coverage of up to 800 m (2,600 ft). When used in conjunction with Mantracourt’s BroadWeigh shackles and load monitoring software (BW-LOG100), the combined system can provide directly correlated data of guy-wire and storm-brace tensions in relation to wind speed conditions. This means that wind speed ratings and rigging components within a tent or staging structure can be closely monitored and action can be taken prior to failures occurring. This is especially useful in conjunction with LED video wall rigging, PA towers, roof canopies, marquee tents and other temporary de-mountable structures. The anemometer is housed in an IP67 case & supplied with robust fixing bracket, featuring a high quality 3-cup rotor pressed on a stainless steel shaft with rugged Delrin body with bronze Rulon bushings. This operates alongside the whole range of BroadWeigh devices such as base stations, handheld displays, analogue output, relay modules, GPRS data loggers and more, and is designed and built on Mantracourt’s BroadWeigh 2.4 GHz wireless technology. An outdoor events company were using a stage which had been designed with a canvas canopy mounted above the top of the stage. It was critical for the events manager to be able to monitor the stability of the canopy throughout the event, as the high wind forecast could exert a force on the canopy which could prove dangerous. A BW-WSS wind speed sensor unit was attached to the top of the stage and powered using internal batteries. The unit was used to monitor the wind speed throughout the event on a wireless telemetry Broadweigh handheld. Giving the events manager portable visibility of wind speeds at a glance.